Save up to $1 everyday with Food Junction's Everyday Good Deals Coupons! Only available for redemption at Food Junction United Square. Valid from Monday to Friday, exclude eve of PH and on PH. Valid till 29 Feb 2016. 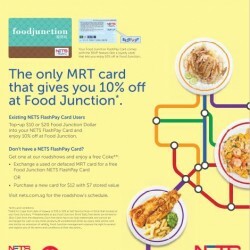 If you eat frequently at Food Junction, here’s a deal you can't miss: Get and enjoy the only MRT card that gives you 10% off at Food Junction. 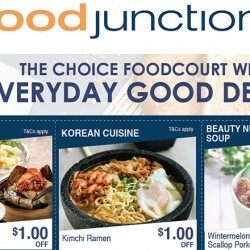 Existing NETS flashPay card users: Top-up $10 or $20 Food Junction Dollar into your NETS FlashPay card and enjoy 10% off at Food Junction. Get to love a good cup of coffee to perk up your lazy mornings or need that extra caffeine boost during afternoon tea breaks. Here’s an awesome offer you simply can’t miss, especially if you work or shop in Funan mall. 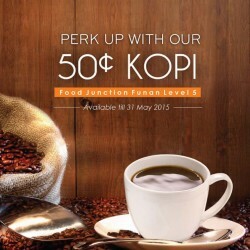 From now till the end of May, Food Junction @ Funan Mall is selling a cuppa coffee for just 50 cents!